This article is about the region in England. For the park in Boston, see The Fens (Boston, Massachusetts). For other uses, see Fen (disambiguation). Map of eastern England, showing position of the Fens. The Fens, also known as the Fenlands, are a coastal plain in eastern England. This natural marshy region supported a rich ecology and numerous species, as well as absorbing storms. Most of the fens were drained several centuries ago, resulting in a flat, dry, low-lying agricultural region supported by a system of drainage channels and man-made rivers (dykes and drains) and automated pumping stations. There have been unintended consequences to this reclamation, as the land level has continued to sink and the dykes must be built higher to protect it from flooding. A fen is the local term for an individual area of marshland or former marshland. It also designates the type of marsh typical of the area, which has neutral or alkaline water chemistry and relatively large quantities of dissolved minerals, but few other plant nutrients. Fenland primarily lies around the coast of the Wash, occupying an area of nearly 1,500 sq mi (3,900 km2) in Lincolnshire, Cambridgeshire, and Norfolk. Most of the Fenland lies within a few metres of sea level. As with similar areas in the Netherlands, much of the Fenland originally consisted of fresh- or salt-water wetlands. These have been artificially drained and continue to be protected from floods by drainage banks and pumps. With the support of this drainage system, the Fenland has become a major arable agricultural region in Britain for grains and vegetables. The Fens are particularly fertile, containing around half of the grade 1 agricultural land in England. The Fens have been referred to as the "Holy Land of the English" because of the former monasteries, now churches and cathedrals, of Crowland, Ely, Peterborough, Ramsey and Thorney. Other significant settlements in the Fens include Boston, Cambridge, Spalding, and Wisbech. The Fens are very low-lying compared with the chalk and limestone uplands that surround them – in most places no more than 10 m above sea level. As a result of drainage and the subsequent shrinkage of the peat fens, many parts of the Fens now lie below mean sea level. Although one writer in the 17th century described the Fenland as entirely above sea level (in contrast to the Netherlands), the area now includes the lowest land in the United Kingdom. Holme Fen in Cambridgeshire, is around 2.75 metres below sea level. Within the Fens are a few hills, which have historically been called "islands", as they remained dry when the low-lying fens around them were flooded. The largest of the fen-islands is the Isle of Ely, on which the cathedral city of Ely was built: its highest point is 39 m above mean sea level. Without artificial drainage and flood protection, the Fens would be liable to periodic flooding, particularly in winter due to the heavy load of water flowing down from the uplands and overflowing the rivers. Some areas of the Fens were once permanently flooded, creating small lakes or meres, while others were flooded only during periods of high water. In the pre-modern period, arable farming was limited to the higher areas of the surrounding uplands, the fen islands, and the so-called "Townlands", an arch of silt ground around the Wash, where the towns had their arable fields. Though these lands were lower than the peat fens before the peat shrinkage began, the more stable silt soils were reclaimed by medieval farmers and embanked against any floods coming down from the peat areas or from the sea. The rest of the Fenland was dedicated to pastoral farming, fishing, fowling, and the harvesting of reeds or sedge for thatch. In this way, the medieval and early modern Fens stood in contrast to the rest of southern England, which was primarily an arable agricultural region. Since the advent of modern drainage in the 19th and 20th centuries, the Fens have been radically transformed. Today arable farming has almost entirely replaced pastoral. The economy of the Fens is heavily invested in the production of crops such as grains, vegetables, and some cash crops such as rapeseed and canola. The Great Level of the Fens is the largest region of fen in eastern England: including the lower drainage basins of the River Nene and the Great Ouse, it covers about 500 sq mi (1,300 km2). It is also known as the Bedford Level, after Francis Russell, 4th Earl of Bedford, who headed the so-called adventurers (investors) in the 17th-century drainage in this area; his son became the first governor of the Bedford Level Corporation. In the 17th century, the Great Level was divided into the North, Middle and South Levels for the purposes of administration and maintenance. In the 20th century, these levels have been given new boundaries; they include some fens that were never part of the jurisdiction of the Bedford Level Corporation. The South Level lies to the southeast of the Ouse Washes and surrounds Ely, as it did in the 17th century. The Middle Level lies between the Ouse Washes and the Nene, but historically was defined as between the Ouse Washes and Morton's Leam, a 15th-century canal that runs north of the town of Whittlesey. The North Level now includes all of the fens in Cambridgeshire and Lincolnshire between the Nene and the River Welland. It originally included only a small part of these lands, including the ancient parishes of Thorney and Crowland, but excluding most of Wisbech Hundred and Lincolnshire, which were under their own local jurisdictions. Deeping Fen, in the southern part of Lincolnshire, lies between the River Welland and the River Glen with its tributary the Bourne Eau. The Black Sluice District, much of which was known as the Lindsey Level when it was first drained in 1639, extends from the Glen and Bourne Eau to Swineshead. Its water is carried through to the Haven at Boston. The above were all redrained at one time or another after the Civil War (1642-1649). These were drained in the 18th and 19th centuries. At the end of the most recent glacial period, known in Britain as the Devensian, ten thousand years ago, Britain and continental Europe were joined by the ridge between Friesland and Norfolk. The topography of the bed of the North Sea indicates that the rivers of the southern part of eastern England flowed into the Rhine, hence through the English Channel. From the Fens northward along the modern coast, the drainage flowed into the northern North Sea basin. As the ice melted, the rising sea level drowned the lower lands, leading ultimately to the present coastline. These rising sea levels flooded the previously inland woodland of the Fenland basin; over the next few thousand years both saltwater and freshwater wetlands developed as a result. Silt and clay soils were deposited by marine floods in the saltwater areas and along the beds of tidal rivers, while organic soils, or peats, developed in the freshwater marshes. Fenland water levels peaked in the Iron Age; earlier Bronze and Neolithic settlements were covered by peat deposits, and have only recently been found after periods of extensive droughts revealed them. During the Roman period, water levels fell once again. Settlements developed on the new silt soils deposited near the coast. Though water levels rose once again in the early medieval period, by this time artificial banks protected the coastal settlements and the interior from further deposits of marine silts. Peats continued to develop in the freshwater wetlands of the interior fens. Washes: these are places such as tidal mud flats and braided rivers, which are sometimes exposed and at other times covered with water. Salt marsh: this is the higher part of a tidal wash, on which salt-adapted plants grew. Fen: this is a broad expanse of nutrient-rich shallow water in which dead plants do not fully decay, resulting in a flora of emergent plants growing in saturated peat. Moor: this developed where the peat grew above the reach of the land water which carried the nutrients to the fen. Its development was enabled where the fen was watered directly by rainfall. The slightly acidic rain washed the hydroxide ions out of the peat, making it more suitable for acid-loving plants, notably Sphagnum species. This is the same as bog, but the word moor was applied to this acid peatland occurring on hills. These moors disappeared in the 19th century. Researchers did not think that the Fenland had this kind of peat, until the discovery of archeological and documentary evidence showing that it did until the early 19th century. In general, of the three principal soil types found in the Fenland today, the mineral-based silt resulted from the energetic marine environment of the creeks, the clay was deposited in tidal mud-flats and salt-marsh, while the peat grew in the fen and bog. The peat produces black soils, which are directly comparable to the American muck soils. A roddon, the dried raised bed of a watercourse, is more suitable for building than the less stable peat. Since the 19th century, all of the acid peat in the Fens has disappeared. Drying and wastage of peats has greatly reduced the depth of the alkaline peat soils and reduced the overall elevation of large areas of the peat fens. There is evidence of human settlement near the Fens from the Mesolithic on. The evidence suggests that Mesolithic settlement in Cambridgeshire was particularly along the fen edges and on the low islands within the fens, to take advantage of the hunting and fishing opportunities of the wetlands. The Romans constructed the Fen Causeway, a road across the Fens to link what later became East Anglia with what later became central England; it runs between Denver and Peterborough. They also linked Cambridge and Ely. Generally their road system avoided the Fens, except for minor roads designed for exporting the products of the region, especially salt, beef and leather. Sheep were probably raised on the higher ground of the Townlands and fen islands, then as in the early 19th century. There may have been some drainage efforts during the Roman period, including the Car Dyke along the western edge of the Fenland between Peterborough and Lincolnshire, but most canals were constructed for transportation. How far seaward the Roman settlement extended is unclear owing to the deposits laid down above them during later floods. The early post-Roman settlements were made on the Townlands. It is clear that there was some prosperity there, particularly where rivers permitted access to the upland beyond the fen. Such places were Wisbech, Spalding, Swineshead and Boston. All the Townlands parishes were laid out as elongated strips, to provide access to the products of fen, marsh and sea. On the fen edge, parishes are similarly elongated to provide access to both upland and fen. The townships are therefore often nearer to each other than they are to the distant farms in their own parishes. After the end of Roman Britain, there is a break in written records. 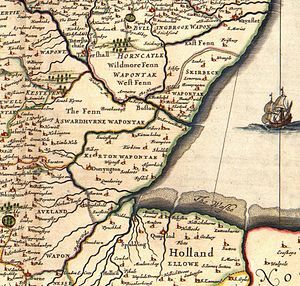 It is thought that some Iceni may have moved west into the Fens to avoid the Angles, who were migrating across the North Sea from Angeln (modern Schleswig) and settling what would become East Anglia. Surrounded by water and marshes, the Fens provided a safe area that was easily defended and not particularly desirable to invading Anglo-Saxons. The names of West Walton, Walsoken and Walpole are believed to suggest the native British population, as the Wal- coming from the Old English walh, meaning "foreigner". However, the villages are in close proximity to the old Roman sea wall, so the wal- element is more probably from wal or weal, meaning "wall". Walton is generally believed to mean "wall-town", Walsoken to mean "the district under particular jurisdiction by the wall", and Walpole to mean simply "wall-pole" (Old English wal and pal) or perhaps "well pool" (Old English welle and pol). When written records resume in Anglo-Saxon England, the names of a number of peoples of the Fens are recorded in the Tribal Hidage and Christian histories. They include North Gyrwe (Peterborough and Crowland), South Gyrwe (Ely), the Spalda (Spalding), and Bilmingas (part of south Lincolnshire). In the early Christian period of Anglo-Saxon England, a number of Christians sought the isolation that could be found in the wilderness of the Fens. Later classified as saints, often with close royal links, they include Guthlac, Etheldreda, Pega, and Wendreda. Hermitages on the islands became centres of communities which later developed as monasteries with massive estates. In the Life of Saint Guthlac, a biography of the East Anglian hermit who lived in the Fens during the early 8th century, Saint Guthlac was described as attacked on several occasions by people he believed were Britons, who were then living in the Fens. However, Bertram Colgrave, in the introduction to one edition, doubts this account, because of the lack of evidence of British survival in the region. British place names in the area are "very few". Monastic life was disrupted by Danish (Anglo-Saxon) raids and centuries of settlement from the 6th century, but was revived in the mid-10th-century monastic revival. In the 11th century the whole area was incorporated into a united Anglo-Saxon England. The Fens remained a place of refuge and intrigue. It was here that Alfred Aetheling was brought to be murdered and here where Hereward the Wake based his insurgency against Norman England. Fenland monastic houses include the so-called Fen Five (Ely Cathedral Priory, Thorney Abbey, Croyland Abbey, Ramsey Abbey and Peterborough Abbey) as well as Spalding Priory. As major landowners, the monasteries played a significant part in the early efforts at drainage of the Fens. During most of the 12th century and the early 13th century, the south Lincolnshire fens were afforested. The area was enclosed by a line from Spalding, along the River Welland to Market Deeping, then along the Car Dyke to Dowsby and across the fens to the Welland. It was deforested in the early 13th century. There is little agreement as to the exact dates of the establishment and demise of the forest, but it seems likely that the deforestation was connected with the Magna Carta or one of its early 13th-century restatements, though it may have been as late as 1240. The forest would have affected the economies of the townships around it and it appears that the present Bourne Eau was constructed at the time of the deforestation, as the town seems to have joined in the general prosperity by about 1280. Though the forest was about half in Holland (Lincolnshire) and half in Kesteven, it is known as Kesteven Forest. Though some signs of Roman hydraulics survive, and there were also some medieval drainage works, land drainage was begun in earnest during the 1630s by the various investors who had contracts with King Charles I to do so. The leader of one of these syndicates was the Earl of Bedford, who employed Cornelius Vermuyden as engineer. Contrary to popular belief, Vermuyden was not involved with the draining of the Great Fen in Cambridgeshire and Norfolk in the 1630s, but only became involved with the second phase of construction in the 1650s. The scheme was imposed despite huge opposition from locals who were losing their livelihoods based on fishing and wildfowling. Fenmen known as the Fen Tigers tried to sabotage the drainage efforts. Two cuts were made in the Cambridgeshire Fens to join the River Great Ouse to the sea at King's Lynn – the Old Bedford River and the New Bedford River, the latter being known also as the Hundred Foot Drain. Both cuts were named after the Fourth Earl of Bedford who, along with some gentlemen adventurers (venture capitalists), funded the construction and were rewarded with large grants of the resulting farmland. The work was directed by engineers from the Low Countries. 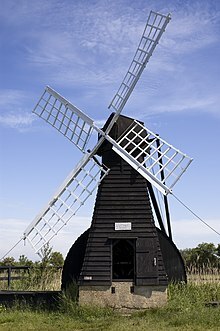 Following this initial drainage, the Fens were still extremely susceptible to flooding, so windpumps were used to pump water away from affected areas. The Company of Adventurers were more formally incorporated in 1663 as the Bedford Level Corporation. However, their success was short-lived. Once drained of water, the peat shrank, and the fields lowered further. The more effectively they were drained, the worse the problem became, and soon the fields were lower than the surrounding rivers. By the end of the 17th century, the land was under water once again. Though the three Bedford Levels together formed the biggest scheme, they were not the only ones. Lord Lindsey and his partner Sir William Killigrew had the Lindsey Level inhabited by farmers by 1638, but the onset of the Civil War permitted the destruction of the works until the 1765 Act of Parliament that led to the formation of the Black Sluice Commissioners. Many original records of the Bedford Level Corporation, including maps of the Levels, are now held by Cambridgeshire Archives and Local Studies Service at the County Record Office in Cambridge. The major part of the draining of the Fens was effected in the late 18th and early 19th century, again involving fierce local rioting and sabotage of the works. 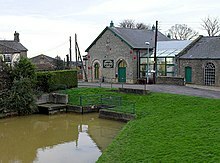 The final success came in the 1820s when windpumps were replaced with powerful coal-powered steam engines, such as Stretham Old Engine, which were themselves replaced with diesel-powered pumps, such as those at Prickwillow Museum and, following World War II, the small electric stations that are still used today. The dead vegetation of the peat remained undecayed because it was deprived of air (the peat being anaerobic). When it was drained, the oxygen of the air reached it, since then the peat has been slowly oxidizing. This, together with the shrinkage on its initial drying and the removal of soil by the wind, has meant that much of the Fens lies below high tide level. As the highest parts of the drained fen are now only a few metres above mean sea level, only sizeable embankments of the rivers, and general flood defences, stop the land from being inundated. Nonetheless, these works are now much more effective than they were. The Fens today are protected by 60 miles (97 km) of embankments defending against the sea and 96 miles (154 km) of river embankments. Eleven internal drainage board (IDB) groups maintain 286 pumping stations and 3,800 miles (6,100 km) of watercourses, with the combined capacity to pump 16,500 Olympic-size swimming pools in a 24-hour period or to empty Rutland Water in 3 days. As of 2008, there are estimated to be 4,000 farms in the Fens involved in agriculture and horticulture, including arable, livestock, poultry, dairy, orchards, vegetables and ornamental plants and flowers. They employ about 27,000 people in full-time and seasonal jobs. In turn, they support around 250 businesses involved in food and drink manufacturing and distribution, employing around 17,500 people. Over 70% of the Fens is involved in environmental stewardship schemes, under which 270 miles (430 km) of hedgerow and 1,780 miles (2,860 km) of ditches are managed, providing large wildlife corridors and habitat for endangered animals such as the water vole. In 2003, the Great Fen Project was initiated to return parts of the Fens to their original pre-agricultural state. The periodic flooding by the North Sea, which renewed the character of the Fenlands, was characterised conventionally by the 1911 Encyclopædia Britannica as "ravaged by serious inundations of the sea". The modern approach is to allow a little farmland to be flooded again and turned into nature reserves. By introducing fresh water, the organisers of the project hope to encourage species such as the snipe, lapwing and bittern. Endangered species such as the fen violet will be seeded. The Fens Waterways Link is a scheme to restore navigation to some of the drainage works. It is planned to bring the South Forty-Foot Drain and parts of the Car Dyke into use as part of a route between Boston and Cambridge. The Fens is the origin of English bandy and speed skating. It is the base of Great Britain Bandy Federation and in Littleport there is a project in place aiming at building an indoor stadium for ice sports. If successful it will have the largest sheet of ice in the country with both a bandy pitch and a speed skating oval. Spalding, a market town, administrative centre of South Holland, and famed for its annual Flower Parade held from 1959 to 2013. John Gordon, adolescent fiction writer and author of The Giant Under The Snow, drew inspiration for many of his supernatural fantasies from the Fens. His books with Fenland themes include: Ride The Wind, Fen Runners and The House On The Brink, which was based on Peckover House in Wisbech. Peter F. Hamilton sets a number of his science fiction novels in the Fens, including Mindstar Rising and A Quantum Murder. M. R. James set several of his ghost stories in the fen country. Jim Kelly set The Water Clock, The Moon Tunnel and The Funeral Owl in the Fens. Philippa Pearce, a children's author, set many of her books in the Fens, for example Tom's Midnight Garden. Gladys Mitchell, prolific writer of detective fiction, took her eccentric sleuth, the psychiatrist Mrs Lestrange Bradley, to the Fens in several books, notably The Worsted Viper, Wraiths and Changelings and The Mudflats of the Dead. Robert Louis Stevenson's The Black Arrow has several chapters set in the Fens. Nick Warburton wrote a series of radio plays entitled On Mardle Fen, one of the longest running series of plays on BBC R4. Susanna Gregory's Matthew Bartholomew chronicles' title character is a fictional physician living in 14th-century Cambridge. G. A. Henty's book Beric the Briton mentions some sections in the Fens. Norah Lofts features a character called Ethelreda Benedict, who comes from a small island in the Fens in the 17th century, in the second book of her "House" trilogy, The House at Old Vine. Louis L'Amour's "To The Far Blue Mountains", the central character Barnabas Sackett from "Sackett's Land" returns to his home in the Fens one last time in the opening chapter. Eric Flint & Andrew Dennis: "1635: A Parcel of Rogues"
Lesley Glaister: Honour Thy Father. Dad Savage (1998), starring Patrick Stewart, was set and filmed around the King's Lynn area. Waterland (1992), directed by Stephen Gyllenhaal, is based on Graham Swift's book with the same title. Many of its scenes were filmed at Holbeach Marsh on the edge of the Wash. The 1974 Look and Read series Cloud Burst was set and filmed in the Fens. The episode Three Miles Up of the 1995 BBC series Ghosts was set in the Fens. "The Bedford Level" appears in the video game Tom Clancy's EndWar as a possible battlefield. The Lost Crown: A Ghost-Hunting Adventure is set in a fictional town called Saxton, located in the Fens. ^ After Lindley, Keith (1982). Fenland riots and the English revolution. Heinemann Educational Books. ISBN 978-0-435-32535-0. ^ It is debated whether this area includes the fen areas of north Lincolnshire, such as the Isle of Axholme. Some scholars, such as Keith Lindley, include the Isle of Axholme as part of the Fenland, as it has the same kind of environment and a similar environmental and social history. But it is not contiguous with the rest of the East Anglian Fenland, nor was its drainage ever jointly organised with that of any of the main Fenland drainage areas. It is generally designated as a separate area. ^ Wise, John; Noble, W. Mackreth (1882). Ramsey Abbey: Its Rise and Fall. Huntingdon: Ellis & Cooper. ISBN 0-904701-10-7. ^ Christian, Anne Hait (1984). The Search for Holmes, Robson, Hind, Steele and Graham Families of Cumberland and Northumberland, England. La Jolla, CA: Search. p. 7. ISBN 0-9613723-0-3. ^ H. C. A discourse concerning the drayning of fennes and surrounded grounds in the sixe counteys of Norfolk, Suffolke, Cambridge, with the Isle of Ely, Huntington, Northampton and Lincolne. London: 1629. Reprinted in 1647 under title: The Drayner Confirmed, and the Obstinate Fenman Confuted. ^ "UK's lowest spot is getting lower". BBC. 29 November 2002. Retrieved 26 March 2010. ^ "An Act for settling the Draining of the Great Level of the Fens called Bedford Level", 1663, reproduced in Samuel Wells, The History of the Drainage of the Great Level of the Fens called Bedford Level, (London, 1830), Vol.2, pp.383ff. ^ a b c David Hall and John Coles, "Fenland Survey. An essay in landscape and persistence", Archeological Report 1. English Heritage, 1994. ^ Christopher Taylor. The Cambridgeshire Landscape. Hodder and Stroughton, London, 1973. p30. ^ Hall, David; Coles, John (1994). Fenland survey: an essay in landscape and persistence. English Heritage. ISBN 978-1-85074-477-1. ^ Simon Young, AD500 p.245 (Notes & Sources) references Life of Saint Guthlac (Cambridge University Press 1956), pp. 108–11. ^ "ULAS – Thorney". University of Leicester Archaeological Services. 26 February 2007. Retrieved 17 March 2011. ^ "New Page 1". info.sjc.ox.ac.uk. Retrieved 19 March 2018. ^ "Historyof the Black Sluice Internal Drainage Board". Archived from the original on 28 April 2011. ^ a b c "Why Farming Matters in the Fens (2)". NFU East Anglia. 2008. Archived from the original (PDF) on 27 April 2011. Retrieved 17 March 2011. ^ "Members - Federation of International Bandy". www.worldbandy.com. Retrieved 19 March 2018. ^ "theicestadiumproject". theicestadiumproject. Retrieved 19 March 2018. ^ "honour thy father". Lesley Glaister. Retrieved 19 March 2018. ^ Thorpe, Adam (2 April 2014). "The Wake by Paul Kingsnorth review 'A literary triumph'". The Guardian. Retrieved 15 September 2015. Dugdale, William (1662). History of Imbanking and Drayning of Divers Fens and. Marshes. London. Wheeler M.Inst.C.E, William Henry (1896). A History of the Fens of South Lincolnshire, being a description of the rivers Witham and Welland and their estuary, and an account of the Reclamation, Drainage, and Enclosure of the fens adjacent thereto. (2nd ed.). J.M. Newcombe (Boston), Simpkin, Marshall & Co. (London). doi:10.1680/ahotfosl2e.50358. Page, William; Proby, Granville; Inskip Ladds, S., eds. (1936). A History of the County of Huntingdon. Victoria County History. 3. pp. 249–290: "The Middle Level of the Fens and its reclamation". Retrieved 30 December 2010. Ash, Eric (2017). The Draining of the Fens. Johns Hopkins University Press. Retrieved 15 March 2017. Wikimedia Commons has media related to The Fens.